Between hope & civil war? 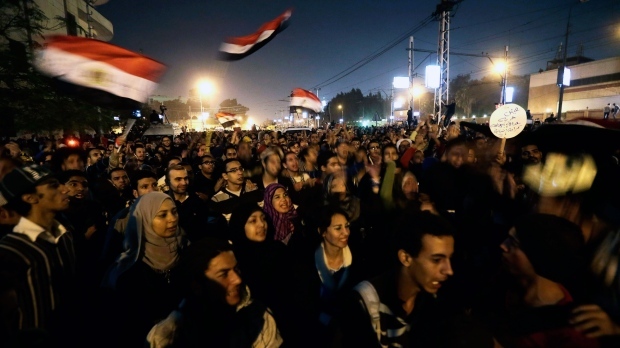 Egypt has become a country of duelling demonstrations and rising civil conflict. Today, Friday December 7, tens of thousands demonstrate in iconic Tahrir Square and outside the presidential palace demanding that President Morsi rescind his decree granting himself extraordinary powers and to cancel the divisive constitutional referendum scheduled for December 15. Thousands more demonstrate in Alexandria, Suez, Mahalla and around the country. This follows three other major demonstrations that have mobilized hundreds of thousands of Egyptians against the decree. On the other side of town, the Muslim Brotherhood – from which Morsi hails and was a long-time senior leader – along with their ultra-conservative Salafist allies demand that Egyptians obey the “legitimate” president. They have massed outside the independent TV stations that are concentrated in one area of Cairo, demanding “unbiased coverage”. There were reports that they had stormed the buildings. Last weekend the MB and their allies mobilized hundreds of thousands to demonstrate their support for President Morsi and for Sharia law. Beyond mere protesting, the conflict has quickly escalated to violence – people on both sides have been killed and likely thousands have been injured. It’s not clear who started the street violence first – scattered reports have suggested it was MB members attacking opposition protests – but there can be no doubt that the cause of this conflict lies squarely with Morsi and with the Brotherhood and their allies. For months Morsi’s government has conciliated with the military and the old Mubarak apparatus, permitting torture and military trials of civilians to continue, restricting labour rights, refusing to recognize independent unions and more. They have bent over backwards to accommodate the wealthy, including agreeing an IMF loan that will lead to terrible austerity. It is now clear that Morsi’s and the Brotherhood’s main goal was to pass a constitution that enshrined the principles of their organization as the main guiding principles of Egypt. The attempt to window-dress it with a few belated and minor concessions to the demands of the revolution – in particular re-trying those cops and regime officials who were acquitted of murdering revolutionaries – didn’t wash. In some ways this isn’t surprising. The MB leadership were always very hesitant supporters of the revolution, holding back their members from participating in the demonstrations in Tahrir Square in the lead up to the February, 2011 revolution. It was only when the movement threatened to surpass and leave them behind that they threw their weight behind it reluctantly. Still, at every opportunity, they backed away from confronting the military, sought to conciliate with them and even met with the SCAF to work out a deal to reduce social tensions. But it seems that Morsi and the MB leadership are too used to being the only organized opposition in Egypt. When demonstrations and rioting exploded onto the streets of Egypt they were caught off guard. They have handled the emergence of a mass opposition movement with utter incompetence and heavy-handedness. The decree that granted Morsi extraordinary powers – more even than Mubarak was permitted – was written up without even consulting Morsi’s vice president let alone major opposition figures. Nor has Morsi shown any ability to compromise or seriously dialogue with the opposition that exists. At each step, when he hasn’t simply disappeared from view, he has escalated the tension. His response to the unprecedented protests and strikes by judges was to speed up the already discredited constitutional process. The Constituent Assembly, undermined by the walk-out by pretty much everyone who wasn’t an Islamist, cranked out the constitution in 48 hours. It became clear that the intentions of the MB and their Salafist allies were to enshrine their agenda in law. Post-factum offers to talk about how the constitution might be changed after it is accepted have been taken as insults by the opposition. Unsurprisingly it led to a major conflict with the result that seven people died, including a well-known reporter who supported the revolution, and over 700 were injured. The explosion of fury across the nation led to the torching of numerous Brotherhood and Freedom & Justice Party – the MB’s political party – offices. The anger was made worse by the fact that the MB/FJP blatantly lied about what was going on. As their members were beating protestors with clubs and fists, and later with pellet and shot guns, they claimed that it was the other way around. They claimed that the dead, primarily opposition protestors, were all MB members. Official statements, including from Morsi claimed that all the violence was from the opposition side, hinting at a dark conspiracy that reminded many of Mubarak’s tactics for silencing dissent. All of these missteps and escalations by the MB have now made it very difficult to pull Egypt back from the brink of major civil conflict. The spirit of the revolution – bread, freedom and social justice – is embodied in the opposition movement. But unlike Mubarak’s regime that could mobilize little, the MB have a large base of supporters who they can mobilize and who believe fervently in their organizations and their leadership. Street mobilizations alone will probably not be enough to defeat, convince and demoralize this deeply rooted organization. Ultimately, a real victory will require the same kind of strike action by workers that brought down Mubarak. Affordable Room on Subway Line!